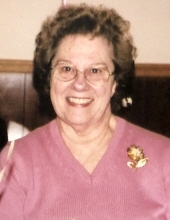 WINSTED - Evelyn Elizabeth (Colavecchio) Bordonaro, passed away peacefully on March 25, 2019 at UCONN John Dempsey Hospital. She was the loving wife of the late Francis R. Bordonaro for 62 years. Born February 2, 1930 in Winsted; the daughter of the late John and Nancy (LaStoria) Colavecchio. Evelyn graduated from The Gilbert School. She worked for Cigna for 15 years as an Executive Assistant. She enjoyed gardening and trips to the Cape. She is survived by two children, her daughter, Susan Bordonaro and her son, Stephen Bordonaro and wife Tracy; two grandchildren, Shane Bordonaro and wife Maria and Jennifer Bordonaro and great grandchildren, Malia and Michael Bordonaro. She is also survived by a sister, Pauline DiBiasi and a brother, John Colavecchio; and several nieces and nephews. She was predeceased by a sister, Margaret Impelluso and a brother, Dominic Colavecchio. The family would like to express their gratitude to the entire staff at UCONN John Dempsey Hospital in Farmington for their sincere, exceptional care and dedication to making her comfortable in her last days. Services will be private. Montano-Shea Funeral Home, 922 Main Street, Winsted has care of the arrangements. Evelyn loved animals and the family is asking in lieu of cards and flowers to donate to the noble charity for all military and police dogs in her memory with checks made out to: Nam Knights MC Westside Chapter, PO Box 883, Brandon, FL 33509 with K-9 Memorial in the memo. Visit an online guestbook at montano-shea.com. To plant a tree in memory of Evelyn Elizabeth Bordonaro, please visit our Tribute Store. "Email Address" would like to share the life celebration of Evelyn Elizabeth Bordonaro. Click on the "link" to go to share a favorite memory or leave a condolence message for the family.